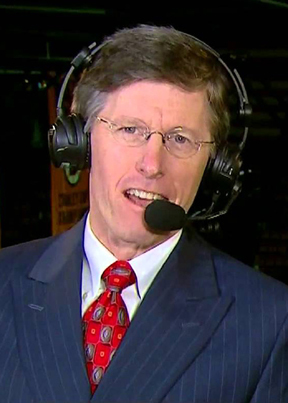 Providence, RI (6/18/2018): Jack Edwards, colorful television play-by-play announcer for the Boston Bruins, will join the list of special guests along with as many as 20 or more former Reds players and other hockey greats when the Rhode Island Reds Heritage Society holds its 18th annual reunion weekend August 3, 4 and 5"
From high above the Bruins' ice for 11 seasons now, Edwards has become one of the most recognized of play-by-play NHL television broadcasters. His game research, constant focus and accuracy and clarity in calling plays make an enjoyable evening for Bruins viewers. Controversy, though, has not avoided him. He has been labeled a "homer” by other opposing team "homers." But who doesn’t enjoy having a homer on their broadcast team. He freely calls plays as he sees them and sometimes offers his opinions on debatable referee decisions. Edwards teams with former Bruins’ star Andy Brickley, who complements with game play analysis. Nice fit. Both are grads of UNH where Jack began broadcasting Wildcats’ Hockey East games way back when. Since then, he has worked at a number of stations like ESPN and even WJAR-TV (Channel 10) here in Providence. Edwards will guest speak at the reunion’s annual/dinner dance at Chelo’s banquet facility on Post Road in Warwick on Saturday, August 4 at 6:00 pm. There, he is expected to immerse his audience with interesting topics, such as what it's like to call Bruins' and NHL play-by-play hockey from high above the ice. Folks can also expect interesting road trip stories, opinions on hockey rules and referee interpretations of same and, of course, what it’s like to work with "Brick". For more reunion information and reservations, contact Mal Goldenberg at 401-782-6623 or mal@rmcri.com.